The annual National Junior Olympic Shooting Championships (NJOSC) are a right of passage for many Junior shooting athletes across the country and this year’s event is no exception. it kicked off with the Men’s Rifle competition Sunday at the Olympic Training Center in Colorado Springs. POINTER Shotguns will be exhibiting at Legacy Sports International’s booth #312 at the NRA convention in Indianapolis and will have their exciting new 2019 items on display. Fresh off the International Shooting Sport Federation (ISSF) World Cup in Acapulco, Mexico where the USA Shooting Team won three medals, shotgun athletes have now made their way to the United Arab Emirates for the second stop on the World Cup circuit in Al Ain where competition is underway and continues through April 15. After years of planning, site evaluation and opportunities for community input, the Department of Natural Resources is moving forward with construction on improvements at the Echo Point shooting range at Allegan State Game Area in Allegan County. Hornady® has been granted two utility patents related to the RFID technology used in their premium line of RAPiD® Safes. When I first heard that Taurus USA was relocating from cosmopolitan Miami, Florida, area to rural Bainbridge, Georgia, I asked the same question I’ve heard many times since then: why? Bainbridge (in case you’ve never been there) is a small South Georgia town that’s minuscule compared to the sprawl that is Miami. It’s far-better known for farming and great wingshooting properties like Southwind Plantation - than the high-tech manufacturing of today’s gun industry. But Taurus is coming, and in a big way. Construction’s rolling along on a brand-new 205,000 square foot facility that, when completed, will employ around 400 people. 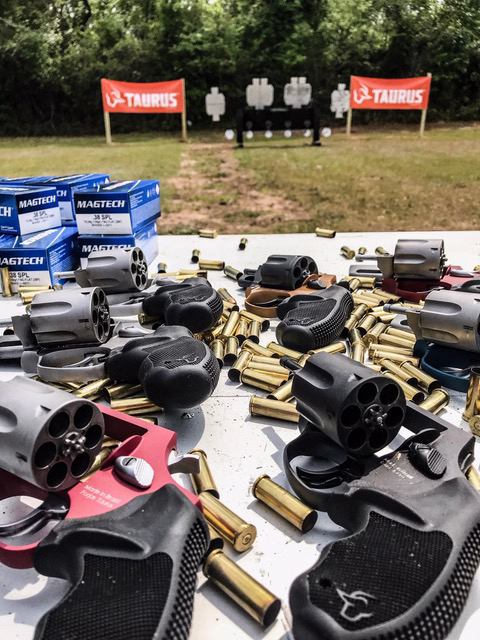 The new Taurus facility in Bainbridge, Georgia is taking shape-and the excitement in the community is building for its imminent arrival. Taurus photo with permission. For someone who’s become resignedly accustomed to hearing workers apologize for employment in the gun industry, that’s great news. And everyone I had the opportunity to speak with in Bainbridge volunteers just how excited they are at this new opportunity. From the maintenance supervisor who cheerfully gave me directions around town to a half-dozen pharmacists where I was getting a prescription filled, everyone told me they’re going to make the people of Taurus feel right at home. Since Taurus’ corporate DNA includes more than a little Hispanic influence, I’d imagined their relocation could give both Bainbridge and the relocated workers a case of culture shock. But the figurative red carpet Bainbridge has rolled out for Taurus is nothing like the begrudging tolerance shown toward anyone in the gun industry who works “up east” or in major metropolitan areas . There, guns are a social no-no. Up east, it’s more a company’s of longevity and history in the area, not admiration for the them or their products, that make them even tolerable. Georgia (with the possible exception of Atlanta) has shown itself more than willing to welcome gun companies. After all, hunting, fishing and shooting are essential pieces of life in the South. There is one small logistical wrinkle in what otherwise sounds like a love fest. Last year, Bainbridge was devastated by Hurricane Michael. As Michael swept through Coffee, Houston, Mitchell, Wilcox and Decatur counties, homes and businesses suffered billions of dollars in damages. Today, many of the buildings in Bainbridge still sport blue tarpaulins covering roofs needing repair. Uprooted trees, damaged fences and heaping piles of debris bear testimony to the devastation. One construction company owner told me his business was booked for the next year -just with roof and structural repairs. That damage has caused a commensurate shortage of available real estate in Bainbridge. Near term, the housing shortage will likely force some relocated staffers to nearby towns like Colquitt. There’s some local concern regarding the distances workers would have to travel if they were forced to nearby towns. They’re unfamiliar with the fact that for workers in metropolitan areas, time, not distance frequently dictates where they live. Workers in a major metropolitan area consider two factors in choosing where they live: the cost of housing versus the time they’ll spent commuting. Having lived in Miami, Atlanta, and New York City, I know that living as little as seven-to-ten miles from the office can translate into an hour of commuting each way. In Bainbridge, a 40-45 minute commute translates into just over 45 miles. Draw a circle with a 45-mile radius around Bainbridge and you’ll see there are plenty of options. If you’re accustomed to measuring commuting in time, not distance, you’ll realize there’s an equation inversion - in your favor. Factor in lowered taxes, favorable home prices and a lower overall cost-of-living, and you understand why nearly a quarter of Taurus’s Florida employees are relocating. Bainbridge is also a place where Taurus is already discovering loyal customers. Blenker delights in telling how people recognize the Taurus logo on his shirts and come over in restaurants to tell him they’re already Taurus owners, but are really excited at the company moving there. Expect to see more of Taurus' new products around South Georgia after their Bainbridge, Georgia, facility gets running. Taurus photo with permission. Drive around Montgomery, Alabama these days, and you’ll see a lot of Hyundais cruising the roads. That wasn’t the case before Hyundai built a manufacturing plant there. In the south, loyalty still runs deep. There may be some initial challenges with accents and speed-of-speech, but it you’re a neighbor that clears away a lot of differences in rural Georgia. And I’m told there are already plans to open a couple of Cuban restaurants in the area. In farm country, coast-to-coast, people judge your products more on their performance and value than their cachet. If a product works as advertised and it’s offered at a fair price, there’s no quarreling with that - especially if it was made in the neighborhood. Another thing that helps convince big companies to uproot their plants and people and head to rural Southern areas like Bainbridge, Montgomery, Tuscaloosa, or Columbia. I’ve heard it every time I’ve covered a corporate relocation in any industry: people want to work- and believe in delivering a fair day’s work for a commensurate wage. If you’re a corporate executive weary of having to avoid certain people in your neighborhood, or are tired of protesters outside your door every time something bad happens, that’s a very appealing idea. Several CEOs who have relocated their companies over the past few years have told me the case for moving to areas where you're welcome offers so many intangibles that it transcends simple spreadsheet evaluation formulas. Based on what I’ve seen and heard in Bainbridge, Taurus has discovered another of those areas in Bainbridge.